Microsoft Groove is the company’s streaming music service, which normally includes a free 30-day trial. But right now, it’s offering a promo code with new sign ups to extend that by 3 extra free months. The service allows users to stream “millions of songs” ad-free, available on Windows, Xbox, Android, iOS, Sonos and the web. Music can be downloaded for offline listening as well. The trial can be cancelled anytime, according to Microsoft. The fine print says the offer is valid until 12:00 AM GMT July 1, 2017, or until promo codes last. 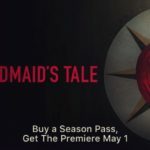 The free codes must be redeemed by August 15, 2017 and sign-ups will require a credit card, which will be auto-billed beyond the free trial. Microsoft says this offer is only available in Canada, the U.S. and the UK, and the music library may differ “by market and over time.” Users will be able to download music on up to 4 devices (but not Xbox and the web). 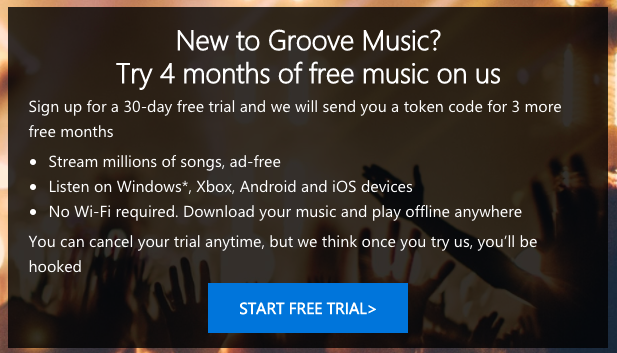 If you’re up for it, click here to sign up for the free 4-month trial to Microsoft Groove. If you’re not on Apple Music, Spotify or Google Play Music, this appears to be a decent free trial for 4 months. Let us know how you like it.